If I were the Colorado Avalanche, this would be my first pick. Nathan MacKinnon, who calls Cole Harbour, Nova Scotia home has been compared by some to be the next Sidney Crosby and not because he’s from the same town. MacKinnon, a strong 17 year old power forward is excepted to go at least in the top 3 in the 2013 NHL entry draft. Coming off of a Memorial Cup win and named MVP of the tournament, the stars could not be more aligned for him right now. Selected first overall by the Baie-Comeau Drakkar in the QMJHL and not being able to speak french, MacKinnon was then traded to the Halifax Mooseheads who he would help head man the team into glory. 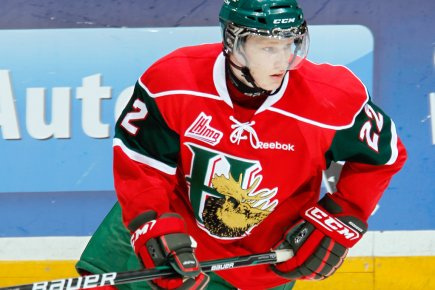 In his 2 seasons with the Mooseheads, MacKinnon has played a total of 102 games. His goals and assists for both years combine for an astonishing 153 points. With Patrick Roy and Joe Sakic both making remarks about not drafting Seth Jones first overall, I have no doubt in my mind MacKinnon is the one they want.